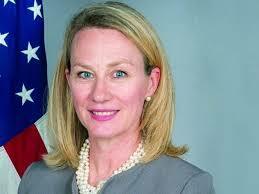 WASHINGTON: US Principal Deputy Assistant Secretary for South and Central Asian Affairs Alice Wells on Thursday said that the US wants mutual cooperation with Pakistan against terrorist organisations. In her interview with an American broadcast organisation, she said that the US wanted to become a partner of Pakistan against terrorist organisations. Wells said that the US focuses on maintaining trade and communication relations with the countries of the region and considers Pakistan an important country for peace and stability in Afghanistan. The US diplomat went on to say that the purpose of Washington’s South Asian strategy was to work closely with Islamabad, adding that the US was also keen to pursue peace talks with the Afghan Taliban. Pakistan and the United States remained at odds over Islamabad’s degree of commitment to rooting out violent extremists and their sources of financing, following a candid exchange between both sides in Islamabad this week. While the US continued to push Pakistan to take action against groups it says operate out of the country against neighbouring Afghanistan and India, Pakistan criticised the US for recent actions that Islamabad said undermined that very objective. “I conveyed to her that the US has done a great disservice to our fight against extremism,” Interior Minister, Ahsan Iqbal, said about his meeting with Lisa Curtis, the US National Security Council’s senior director for South and Central Asia. She was on a two-day visit to Islamabad that ended Tuesday. Iqbal was complaining about the recent US push to list Pakistan as a country that does not have adequate mechanisms to control terrorism financing. As a result of this push, the Financial Action Task Force (FATF), a global watchdog that met in Paris last week, is expected to add Pakistan to its grey list in June. This could hurt Pakistan’s already flailing economy by adding scrutiny to its financial transactions and increasing its costs of doing business internationally. Iqbal said the move linked Pakistan’s fight against extremism to “the US and Western countries, giving extremist groups a narrative that they are being targeted on external pressure”. He also said the economic impact of the FATF decision would shrink the budgetary resources for the ongoing security operations in the country. The FATF move is seen as a way for the US to push Pakistan to change its behaviour toward regional security issues, particularly Afghanistan. The US policy for South Asia, which was announced by President Donald Trump in August of last year, promised to use all instruments of American power, including economic, to get a desired outcome in the region. Curtis reinforced that message in her meetings this week. “Curtis urged the government of Pakistan to address the continuing presence of the Haqqani network and other terrorist groups within its territory, and reiterated the international community’s long-standing concern about ongoing deficiencies in Pakistan’s implementation of its anti-money laundering/counterterrorism finance regime,” said a press release issued by the US embassy in Islamabad. Iqbal said the pressure was unlikely to make a difference. “We have lived through autumn in Pak-US relations many times before. This will also pass,” he said. Still, both sides seemed to want to work past their differences.